OSCAR NOMINATED WHIPLASH is a fierce, pulsating, super-charged story about the kind of obsessiveness and relentlessness that differentiates between the merely excellent and the truly outstanding. 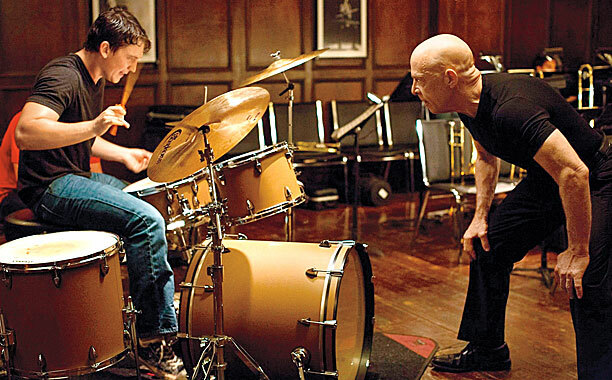 The story centers on the electrifying (and warped) relationship between a teacher Terence Fletcher (an intense J.K. Simmons who you might remember from “Juno” and “True Grit”) and his pupil, Andrew Neeman (Miles Teller from “Divergent”), a nineteen year old drummer at the Shaffer Music Academy. Fletcher is more than a demanding teacher/conductor, he’s a vicious, hectoring, insulting bully. This is not just some -brilliantly written- foul mouthed coach pushing his students to do better, aim higher, this is a terrifying, threatening ogre who won’t stop pushing until he’s reduced his students to sniveling tears. Fletcher recounts with pride the story of a young Charlie Parker being almost decapitated by a cymbal-throwing conductor for playing a wrong note. According to Fletcher, this was the incident that drove Parker into insane levels of practicing from which emerged ‘Bird’, the genius. What he does not recount with pride is that one his students cracked under the pressure and hanged himself. The road to greatness is paved with the dead. The question the story poses is whether Andrew (an earnest Miles Teller who, if he isn’t really a drummer, sure fakes it well) has the drive and resilience to put up with the abuse and deliver on his promise of greatness. Pardon me; the question is rhetorical. We’ve been here before, usually in sports movies where the plucky, battered underdogs surpass themselves to rise to the occasion and, triumphant music in the background, win against the odds. Here the music is that of some fabulous jazz drumming. But – spoiler alert- the sentiment’s the same; you’re meant to leave the cinema cheering. The philosophical issue the movie pretends to deal with: do the ends always justify the means when the potential of greatness is at stake, is a bogus one. In “Whiplash” there really isn’t a whole lot of nuance in the discussion. This is an engaging, highly watchable but simple-minded story about how “practice maketh perfect”, and the pursuit of greatness is without reservation an end that justifies any means. The focus is almost single-mindedly on Andrew: his determination, his gutsiness, his need to excel and be the best. There’s a fleeting glance at his relationship with his –single- father (Paul Riser, who also produced) and a passing blink of a relationship with a woman (Melissa Benoist…mainly from TV appearances). But, like “Foxcatcher”, this is one of those testosterone fuelled male movies where women just aren’t allowed a sniff in (the orchestra Fletcher coaches are all men). To Andrew, and it seems the movie, women are a mere distraction, directionless frills that get in the way of greatness. But let’s not end on a downer. The movie’s really nicely directed. It’s tight, controlled, mature direction. The writing is gleefully venomous. And the writer/Director Damien Chazelle is 29! 29! This is an extraordinary achievement. I look forward to a lot more from this guy. One day he’ll produce a great movie….